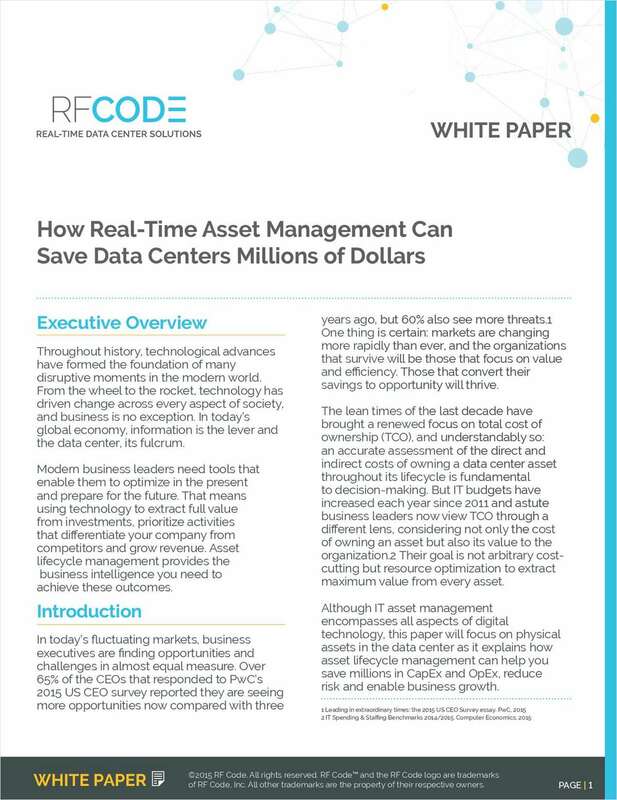 "How Real-Time Asset Management Can Save Data Centers Millions of Dollars"
Free White Paper: "How Real-Time Asset Management Can Save Data Centers Millions of Dollars"
Real-time asset management delivers the accurate information to extract full value from capital investments and grow revenue. By submitting this content request, I have legitimate interest in the content and agree that RF Code, their partners, and the creators of any other content I have selected may contact me regarding news, products, and services that may be of interest to me. Are you responsible for any aspect of your organization's data center operations (examples: asset management, inventory management and audit, asset tracking, data center power and cooling, regulatory compliance, data security)?